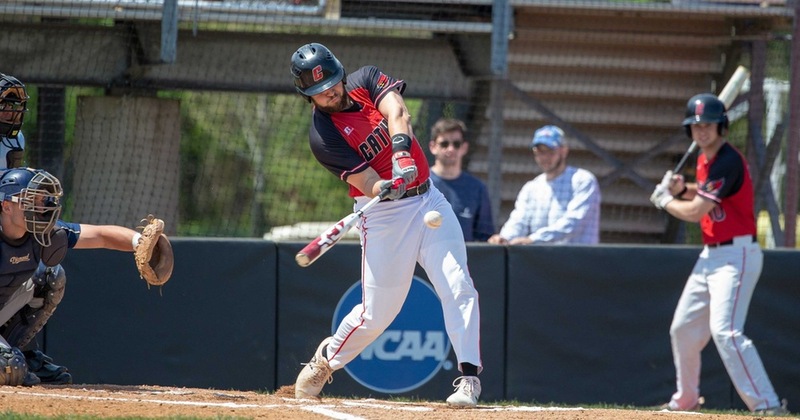 The Catholic University of America men’s baseball team picked up three Landmark Conference wins this past weekend. The wins came on a sweep of the Juniata Eagles in a double header on Saturday, April 21st and a follow up game on the 22nd at Roger J. Talbot field. The first two games ended with late game heroics as junior Bailey Lewis and freshman Michael Doody each hit walk-off doubles. Lewis’ hit came in the bottom of the eleventh to seal a 5-4 victory in the first game and Doody’s capped the game at 6-5. The scoring of the first game started early as senior Jake Crist hit his first of two home runs on the day in the bottom of the first to tie the game at 1-1. Crist would go on to drive in 4 RBIs in the two contests. Juniata came back, however, to score 2 runs of its own in the top of the third inning, but a sacrifice fly from senior Brennan Cotter and Crist’s second RBI in the bottom of the inning brought the game to 3-3. Neither side would manage to score until the eleventh, when Juniata looked like it would steal the first game as they scored a run, making the game 4-3. The CUA veteran Lewis responded brilliantly as he scored sophomore Christian Jones and freshman Andre Perez on his double, ending the game at 5-4. The Catholic team stumbled early in the second half of the doubleheader, falling into a 5-1 deficit through the first four and a half innings. Crist launched the CUA comeback with his second homer of the day in the bottom of the fifth, scoring classmate Jack Hennessey. Junior Ryan Tracy scored his own RBI to bring the game within one, 5-4. The team would pile on home plate as Doody scored classmates Perez and Cole Campbell, ending a 5-run rally to win the game 6-5. The Cardinals’ pitching staff was more than dominant as they combined for 20 strikeouts. Six of which were recorded by rookie Ethan Risse in his 7 innings of work in the first game. Senior reliever Jack Ropelewski earned the first win while striking out four batters of his own in his 1.2 innings of work. Junior Mason Belcher struck out seven in 4.2 innings of work as he got the start in the second game. Sophomore Eric Moore earned his first win of the year by striking out three. The Cards wrap up their regular season this Sunday, April 29th as they host St. Mary’s (Md.) home at Catholic. First pitch of the first stanza is scheduled for 12:00 PM while the second game will start at 3:00 PM. The team sits with a record of 29-5 (12-6), finishing atop the Landmark Conference standings, giving them the top seed in the postseason.